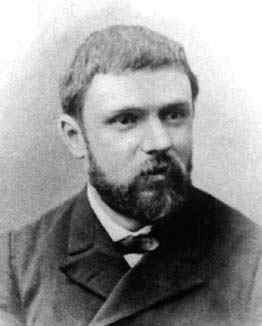 Jules Henri Poincare is known as the originator of algebraic topology. Born April 29, 1854 in Nancy, France. Poincare's genius lead to a whole new branch of mathematics where plain, 2 dimensional figures were no longer studied but more intricate figures were studied in 3 and polydimensional space. In other terms, Poincare lead math to a new direction. Poincare was a very accomplished mathematician who helped Einstein codevelop the Special Theory of Relativity. Additionally, Poincare studied quantum theory, telegraphy, thermodynamics, cosmology and potential theory, to name but a few. In the field of celestial mechanics, Poincare studied electromagnetic wave patterns as well as light. Regarding non-Euclidean geometry, Poincare served to develop the study of algebraic and developed geometric topology. Consequently, study of shapes refuting Euclid's 5th postulate were enhanced and promoted. An accomplished mathematical physicist, Poincare was the first to introduce the concept of Chaos in deterministic systems. His most famous work is entitled Les Methods nouvelle de la mechanique celeste in which he characterized fluid dynamics and convergence. Most importantly, Poincare developed his own conjecture stating that any 2 dimensional surface that has the same fundamental group as the 2 dimensional surface of a sphere is topologically equivalent to a sphere. Finally, there exists the Poincare Disk which is employed to show the relationship between size and spherical/circular boundaries. Poincare finished his career as head of mathematical physics at Sorbonne and he died on July 17, 1912 in Paris.